There are many hidden gems in the historic neighborhoods of Richmond, and three young ladies from the MLK, Jr. Middle School Club spent the summer bringing them to light. Chania, Shanyiah and Ollieshiah from the MLK Investigates interest club teamed up with The Valentine this summer. They began by exploring the history of Richmond before taking what they learned to create individual bus tours. The project allowed each one to nurture their creativity. The trio chose areas that were special to them, researched the important stops along the tour, designed the routes and created a digital version of their tour. 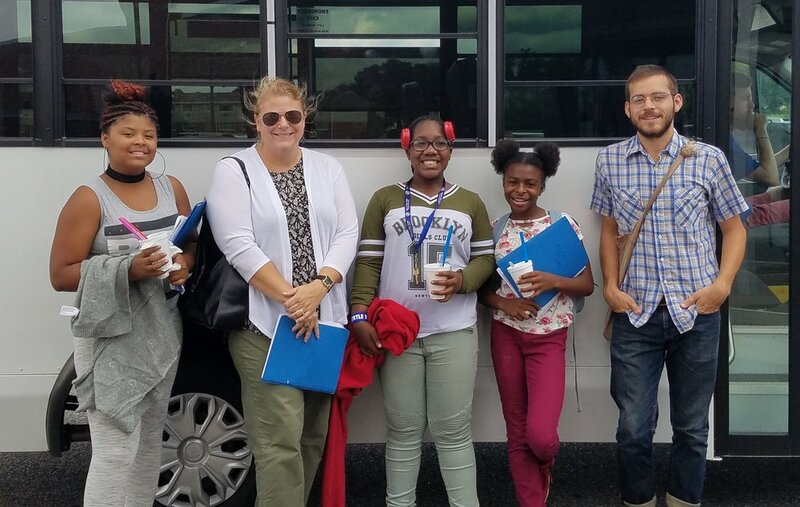 The summer wrapped up with each taking Boys & Girls Clubs of Metro Richmond staff and youth, as well as Valentine Museum staff, on 45-minute tours. Because of our partnerships with community members like The Valentine, Boys & Girls Clubs of Metro Richmond is able to provide unique project-based learning opportunities for our young people. This project taught the basics of research and critical thinking, but it also allowed the young ladies to explore their interests, learn more about their communities and gain self-confidence through their presentations. Chania’s tour centered around the murals of Richmond, beginning with the Hamilton Glass mural of Rev. Martin Luther King, Jr. which spans the bridge of the same name across the street from the MLK Club. Chania will have that chance to use her voice during the fall when she participates in another Hamilton Glass mural which will be painted on a second span of the MLK bridge. Shanyiah, whose passion for music comes from her parents, put together a tour that explored the different music venues of historic Jackson Ward, including the former site of Neverett’s Place at the Eggleston Hotel and the Hippodrome, both spots where B.B. King, Count Basie and Louis Armstrong once played. The bus tours ended on a sweet note with Ollieshiah’s tour which found the best ice cream parlors in Richmond. Shanyiah, Chania and Ollieshiah along with Laura & Alex from The Valentine celebrated their successful bus tours with some frozen treats.